When Bob Tarte bought a house in rural Michigan, he was counting on a tranquil haven. Then Bob married Linda. She wanted a rabbit, which seemed innocuous enough until the bunny chewed through their electrical wiring. And that was just the beginning. Before long, Bob found himself constructing cages, buying feed, clearing duck waste, and spoon-feeding a menagerie of furry and feathery residents. His life of quiet serenity vanished, and he unwittingly became a servant to a relentlessly demanding family. 'They dumbfounded him, controlled and teased him, took their share of his flesh, stole his heart' (Kirkus Reviews). 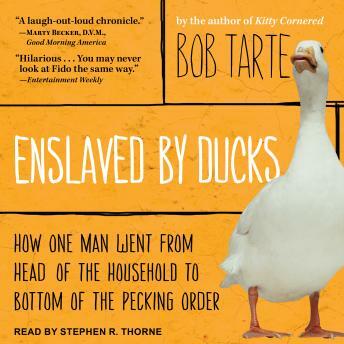 Whether commiserating with Bob over the fate of those who are slaves to their animals or regarding his story as a cautionary tale about the rigors of animal ownership, readers on both sides of the fence have found Tarte's story of his chaotic squawking household irresistible-and irresistibly funny.